I've read that unconditional love is caring about the happiness of another person without any thought for what we might get for ourselves. So it's unselfish love basically. Now that we know the meaning let's get into why you'll never have your husband's unconditional love. Because having unconditional love for someone else is an unselfish act where we want nothing from the person that we feel it for, that knocks a lot of people out of contention. You naturally think that the love a boy has for his mother, or the person that raises him, would be unconditional but it's not. It's a selfish love but rightfully so. When we're bo we rely on someone else to provide everything for us. So we grow to love them because they give us the things that we want and need while we're growing up. Eventually boys become men and choose the woman that we want to marry. Hopefully she's our dream woman. The woman that we fantasize about having for most of our lives. We want to love us and bear our children. We choose her to grow old with us and spend the remaining years of our life with. And the fact that we chose you means, based on the definition, that you will never have our unconditional love. We choose what we want right? The fact that we chose you means that we want something from you. Granted everything that we want from you are good things, that doesn't not change the fact that it's a selfish act at its core. Why? This is because a man chooses his wife when he decides that he doesn't want to share her or want her to be with anyone else. That's the truth of the matter. 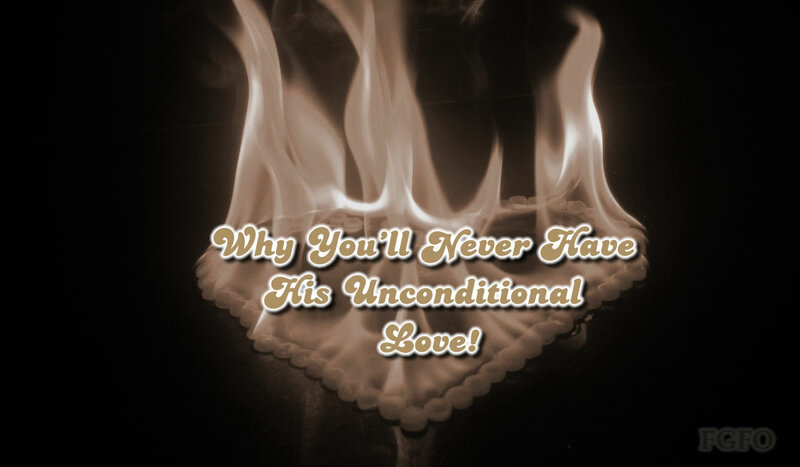 So who will have a man's unconditional love? Who will be the first to experience the true love of a man? Wait for it... His children. Why? Because this is the first time that his love comes without selfishness or choosing. We can choose to have children but we cannot choose who or how they'll be. This is usually our first experience where someone relies on us totally for absolutely everything that they need to survive. Children don't ask to be here but demand everything from you. If our children never give us anything at all, we'll still love them unconditionally. What He Said isn't surprising. If there is any single event that occurs to make a person selfless, it's having a child. Growing up, I was taught that God loved us so much that he gave up his only son to die for us. Back then, I couldn't fathom a love like that. Now, having children of my own, I can. Although we have the capacity to feel unconditional love toward our children, clearly there are exceptions to the rule. Hence, the existence of child abuse, abandoned kids left to the system to take care of, and a host of other atrocities. Selfish by nature, we have to be taught to share and consider the feelings and needs of others. When we have grasped the concept and even mastered the skill of compromise, we are still found lacking when it comes to unconditional love in relationships other than parent to child. Loving in spite of comes close, but doesn't quite compare. And that's my 2¢.